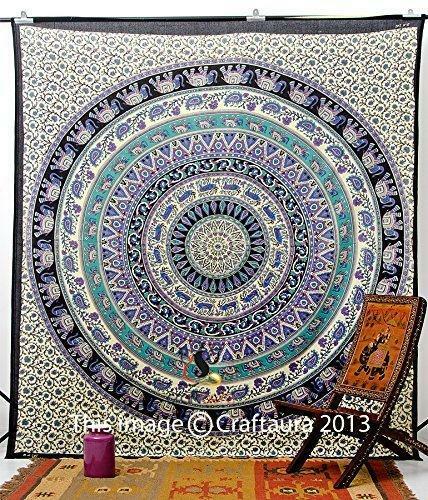 Soft cotton tapestry made exclusively for BR by Magical Thinking. It's the perfect piece for topping off your bed, wall or favorite chair. Doubles as a beach or picnic blanket and is festival-friendly, too! Established in the year 1995, we, “B.R. Enterprises”, are one of the leading organizations, involved in Manufacturer, Exporter, Supplier, Distributor, Wholesaler & Trader a comprehensive collection of Home Furnishings & Ladies Wear. Our product Our range include Cotton Hand Bags, Colorful Cushion Cover & Vintage Blanket. We design and manufacture all our products using premium raw material and latest technology to assure zero quality. For carrying out all the business operations smoothly and accurately, we have developed a state-of-the-art infrastructure. It is installed with latest technology, machinery, tools and instruments that are required for manufacturing a qualitative range of products. To manage our infrastructure efficiently, we have appointed a team of expert professionals, who have years of experience in this domain. They use all the available resources for manufacturing our entire range as per customers demands and requirements. We are exporter our Product in all over the world. It is very essential that you should know about us, for this you should visit our company and work step here in Jaipur than only you will be able to access our quality and capacity of making the goods. Under the able leadership of skilled professionals, we have been able to manufacture, supply and export best quality product range. Our firm was started with an objective of giving prior attention to customers’ needs and we have been working continuously keeping in consideration these working principles.